Retired Lieutenant Colonel William J. "Dixie" Sloan, 78, of Xenia, Ohio, died January 30. 1999. 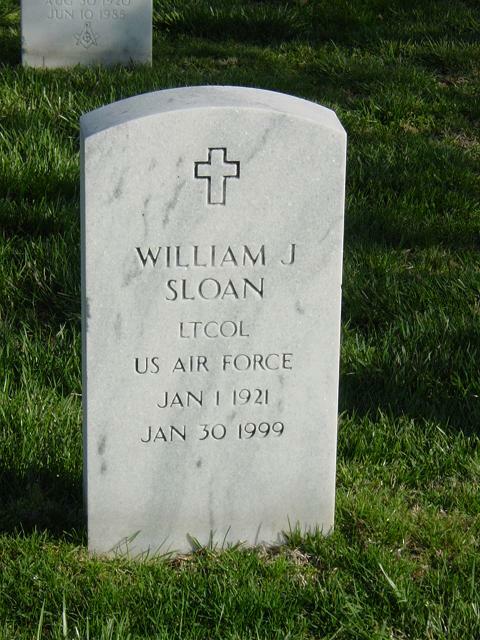 Colonel Sloan was born January 1, 1921, in Richmond, Virginia, and began his military career in 1942. He went to flying school at Kelly Air Force Base, Texas, and was one of the last flying Staff Sergeant pilots before being commissioned a Second Lieutenant in the U.S. Army Air Corps. During World War II, he flew P-38 twin-engine fighters and became the Number 1 fighter ace in North Africa with 12 enemy credits. He also saw duty in the Berlin Airlift in Germany, flying C-54 relief flights. He served as a squadron commander at Barksdale Air Force Base, Louisiana, and was commander of the air-sea rescue squadron at Elemendorf Air Force Base, Alaska, during the Korean War. He later became the Air Force liaison officer to the New York wing of the Civil Air Patrol and worked at Wright-Patterson Air Force Base, Ohio. Among his awards and decorations were the Air Force Cross; Flying Cross; and 20 air medals. Survivors include a son, Major William J. Sloan Jr.; a daughter, Bobbie A. Gregory; five randchildren; and two great-grandchildren. Funeral services were February 8 at Fort Myer, Virginia, and Arlington National Cemetery. The Air Force Cross is presented to William J. Sloan, Lieutenant Colonel (Air Corps), U.S. Army Air Force, for extraordinary heroism in military operations against an armed enemy of the United States as pilot of a P-38 aircraft in the North African Theater of Operations 5 July 1943. On that date, Colonel Sloan led a flight of fighter aircraft escorting thirty-six B-25 bombers in an attack on Gerbini Airdrome. The formation encountered intense antiaircraft fire in the target area and was attacked by ten enemy fighters. Colonel Sloan shot down two of the enemy fighters and as conspicuous in driving the remaining hostile fighters away from the bombers, all of which returned safely. Through his extraordinary heroism, superb airmanship, and aggressiveness in the face of the enemy, Colonel Sloan reflected the highest credit upon himself and the United States Air Force. NOTE: The award was actually presented to Colonel Sloan in 2000.